Now, Maria Calleja and Xosé Anxelu Morán at KAUST's Red Sea Research Center, and coworkers, demonstrate the impact of this daily migration on the vertical movement of carbon in the Red Sea and how it fuels the metabolism of single-celled heterotrophic prokaryotes belonging to the domains Bacteria and Archaea. "In a previous study, our co-authors Anders Røstad and Stein Kaartvedt discovered a community of fish in the Red Sea that migrate every night from around 550 meters depth to the surface waters to feed1," says Calleja. "We wondered how this fish migration might affect the microbial community inhabiting the same depths. Our two projects sought to clarify this by collecting data from a single Red Sea sampling site." Bacterial growth efficiency in the deepest layer was significantly higher than previously estimated, "suggesting a labile DOC source–one that is tasty and easily broken down by the bacteria–that helps generate larger cells," explains Calleja. Heterotrophic bacterial communities in the mesopelagic layer were also found to be more active than those in the surface waters. 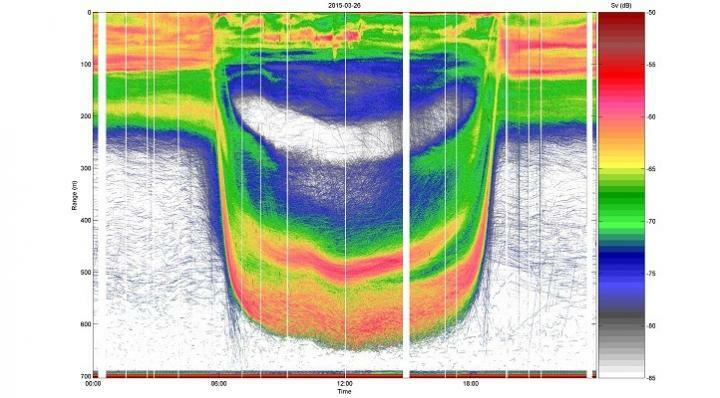 "Our second paper, led by a former KAUST post-doc who is now at the University of Exeter, Francisca García, followed changes over 24 hours along the whole water column, sampling 12 different depths (from 5 to 700 meters) every two hours2," says Calleja. "We analyzed the dynamics between DOC, bacteria and fish movements during the 24-hour cycle." "If this is happening in the Red Sea, could it be happening in other marine basins and the open ocean? It may have unprecedented implications for the global ocean carbon cycle," notes Calleja. "These two studies are part of a wider project to determine the impact of this shortcut on global biogeochemical cycling," adds Morán.